On this particular release by ‘Against it’ records, we have two artists which are sharing the plastic space of the album with their two E.Ps. The symmetrical cover, allowing each of the two artists a full front cover, reveal twelve tracks that are evenly divided between the two parties, although this symmetry ends when we listen to the music. 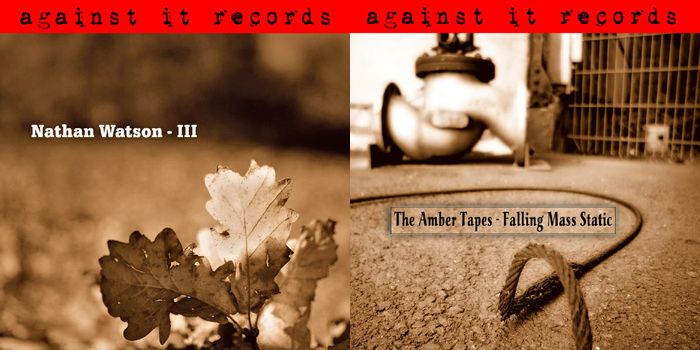 While Watson and The Amber Tapes know how to communicate between themselves, their music differs, sometimes a little and some times a lot. Nathan Watson opens the album with “Takk (Sunrise)”, as electronic drums blast heavy thunders from where a powerful but emotional guitar emerges. Watson plays well on these territories, and while on some parts of his six tracks he reminds me of the current sound incarnation of Isis, he develops quickly into interesting, more intimate moments and manages to surprise and excite. On “This is Goodbye” Watson adds an electronic beat that twists everything we thought we knew about him from the first four tracks, as it add another dimension to the music, reminding of early IDM acts with it’s broken rhythm. When it ends, “Falling Mass Static” opens the second half of this album with a sadder composition, rich with layers and textures. On “Ceremony” the subtle rhythm begins to grow into a more dominant part of the music, and deeper into the second half of the album, ‘The Amber Tapes’ inserts more and more alien sounds and musical twists that make their music unpredictable and tempting. The closing part, “Still”, is perhaps the most dramatic and beautiful moment on the album, as different reversed sounds collide and create a strong contrast between them and the great melody. This epic piece ends the album with an engaging and rare music, concluding a very good work of both Watson and The Amber Tapes, who leave behind them a great album for you to enjoy with.